Kavárna U Knihomola (At the Bookworm’s) not only has the best coffee and best value food that I could find in Hradec Králové, it’s also the most relaxed place I came across, and they play good music. Right on the main square, just across from the modern art museum, U Knihomola couldn’t be more conveniently located. 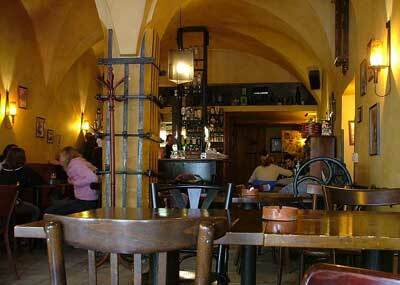 The core of the Kavárna is a long, narrow space with an arched ceiling. The bar is towards the back, but there is table service, so just choose any seat without a reserved sign on it. There are two rows of tables running the length of the building, with an aisle down the middle. The prime seats are probably those just inside the windows. The wooden furniture and worn floorboards give the space a warm lived-in feeling and there are some nice touches to the decoration. Like wine-bottle light shades, the collection of old tins and scales above the bar, and the contraption that rotates the bottles of spirits on a conveyor belt. There’s also an upright piano up against one wall, but I’ve never heard it in action. In the warmer months, there’s also a small deck with four tables out beside the street in the open air, and a lovely garden area at the back, with enough space for fifty or sixty people under big shady umbrellas. Drinks and meals appear to be the same price no matter where you sit. The one downside I could find to U Knihomola is that it can get smoky, so bear this in mind, especially if you’re visiting in the winter and indoors is your only option. They make coffee well and only charge 19Kč for it, with an extra 4Kč if you take milk. The meals are similarly good value. U Knihomola is open from 7am on weekdays, 10am on Saturday and 12 noon on Sunday. Closing time is 11pm, except on Friday and Saturday nights, when it could be open as late as 2am. If you’re really keen you can have guided tour of the kitchen for 125Kč (I have no idea how many people take them up on this offer) or buy a T-shirt with the Kavárna’s red and black logo for 250Kč. There seems to be a crowd of regulars that come back again and again to U Knihomola, and it’s easy to see why.